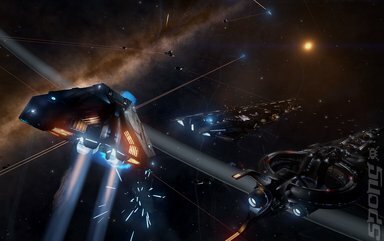 Since the successful launch of Elite Dangerous late last year, the crowd-funded space sim has gone on from strength to strength, with critical and commercial success to build on and an active community behind it. 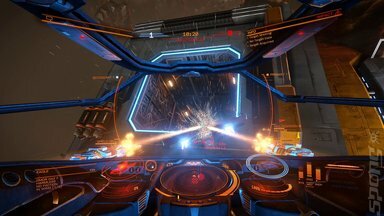 From this base, Frontier Developers is building ever more enhancements to Elite Dangerous with the latest being Elite Dangerous: Horizons. It promises to be a significant expansion to the original game, with landing on lifeless planets for the purposes of mining being the key highlight. During PAX Prime 2015 SPOnG's Chris O'Regan met with Ben Dowie, the Product Manager at Frontier Developments and Executive Producer for Elite Dangerous. Ben spoke to Chris about the development of the expansion as well as its current state. You can read part one of our Elite Dangerous: Horizons interview here. SPOnG: I want to talk about approachability. I personally do play Elite Dangerous with a HOTAS set up. But you have Elite Dangerous on Xbox One, how have you managed to transfer the complex controls from the PC version to the console port? BD: We knew there were few obstacles. We knew technically getting 400 billion star systems into an Xbox One was going to be challenging. Turns out that's not the biggest challenge. Usability and being able to get accessible controls is paramount. 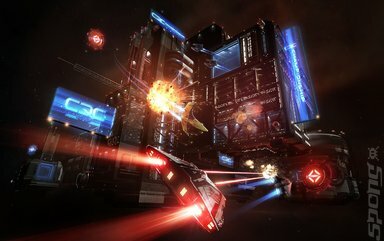 So one of the side benefits of us developing Elite Dangerous for the Xbox One was that we're bringing across a whole lot of investment in usability that will be reflected in the PC version as well. So context actions when you press and hold on the face buttons gives you instant access to d-pad, that will give you actions that are relative around you in the ship, if that makes sense? So when you press and hold these things, it doesn't take long to memorise the few things that you do all the time when you're playing Elite Dangerous. It's usually something like between 10 and 15 things you do all the time. You get your landing gear out, might turn this off, you might turn stealth on, whatever. Those controls, after you've been playing for about 2 hours you can just memorise them. At E3, like here at PAX, we had ambassadors and they've only been playing for a few hours on Xbox One as they are all PC players. After about two hours the context menu never appeared as they learnt the key actions after memorising thanks to repeating the actions so often. SPOnG: Thanks for explaining that, as Elite Dangerous does come across as somewhat intimidating when you first fire it up on an Xbox One. BD: Personally I've just changed my set-up at home, where I have a 50 inch TV, from a very small computer monitor. I've just gone to the Xbox One controller myself and I sit on the couch now I can sit in the comfort of my living room. It's a completely different thing and I don't feel so locked off from the world. Which is sometimes nice I know, sometimes I want to put my headphones on and get lost in the soundtrack and just go out and explore. But sometimes I want to be a part of the world and talk to my girlfriend, who asks me to stop playing Elite please! 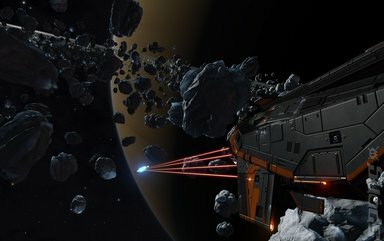 SPOnG: One of the earliest experiences I had with Elite Dangerous was finding that the sense of speed there is with the ships is extraordinary. You really do feel like you're hurtling through space. So much so that when you're approaching a target, it's really difficult to realise that you're going way too fast. Can you talk about how you developed this? BD: There's quite a challenge in getting the system for communicating and using the gauge on the screen to actually get objects into a range and keep it on target. What's really nice about it is that it's kind of a feel thing. It makes you feel more like a pilot and it's a combination of not just technical skill, because the programmers have had to make sure we have all the clever Newtonian physics and whatnot, but it's also a feel thing with the artist and the sound design. It's all those elements that give you that real sense of speed. Like when you fly past quite near to a planet it's quite incredible, that feeling of impending doom if you make a slight mistake, it's terrifying. We've all had that moment and now we're going to open it up and you'll be able to go on these planets. When you do you'll feel the real weight and power of a planet because the gravitation will change the flight model and you're really going to feel like you're going to land on that planet and you're going to have to do that same thing. Like for people when they had to do docking back in the 1980s, that feeling of achievement will be similar. Docking in Elite Dangerous is much easier than the original. So we really want to get that strong feel and I think it's important that it isn't so automatic. You have to make mistakes to feel like you're a pilot. You have to feel like you're a commander in space. I just can't wait for people to get down onto a planet, choose to land anywhere on that planet and just do whatever they want.